In 1981, Jim Crockett promotions developed a club for their fans and called it the "United States Wrestling Club." For a membership fee of $5.00 for one year, fans got the bi-monthly club newsletter "Ringside," a discounted subscription offer on "Mid-Atlantic Wrestling Magazine," discounts on tickets to local Mid-Atlantic Wrestling events, and discounts on concessions at those events. Despite being initially well received by fans, Crockett Promotions folded the club after only one year. 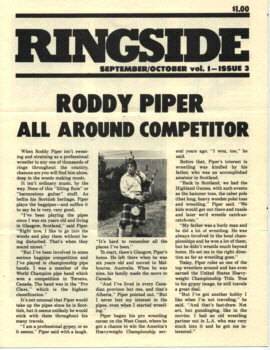 The 3rd 4-page issue of the short-lived "Ringside" newsletter arrived in the fall of 1981. The feature article was editor Steve Waid's interview with Roddy Piper about Piper's diverse hobbies. Roddy enjoys dirt biking, quick-draw, and (of course) the bagpipes! The issue also included Club News, and enrollment form, and letters to the editor (included following the article on Roddy) and a word-jumble puzzle. When Roddy Piper isn’t sweating and straining as a professional wrestler in any one of thousands of rings throughout the country, chances are you will find him alone, deep in the woods, making music. It isn’t ordinary music, by the way. None of this “lilting flute” or “harmonious guitar” stuff. As befits his Scottish heritage, Piper plays the bagpipes – and suffice it to say, he is very, very good. It’s not unusual that Piper would take up the pipes, since he is Scottish, but it seems unlikely he would stick with them throughout his many travels. To start, there’s Glasgow, Piper’s home. He left there when he was six years old and moved to Melbourne, Australia. When he was nine, his family made the move to Canada. Piper began his pro wrestling career on the West Coast, where he got a chance to win the America’s Heavyweight Championship several years ago. “I won, too,” he said. Before that, Piper’s interest in wrestling was kindled by his father, who was an accomplished amateur in Scotland. Today, Piper rules as one of the top wrestlers around and has even earned the United State Heavyweight Championship title. True to his gypsy image, he still travels a great deal. 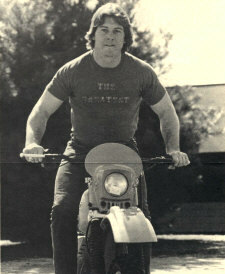 Piper also enjoys dirt-biking, which he learned from a Hollywood stuntman who would do tricks on a motorcycle. “It’s fun to get out there and run all over the place, taking lumps and bumps”, Piper said. Piper’s got quite an interesting set of hobbies – bagpipes, fast-draw and dirt biking. “Well, I never said I did ordinary things,” he explained. I am writing to let you know how much my Mother and I enjoy wrestling. My favorite is Blackjack Mulligan, and my Mom’s favorite is Ric Flair, but we love ‘em all. We are looking forward to a feature on Ric and Blackjack. I enjoyed your features on Ricky Steamboat and Paul Jones, but I’d like to see more personal things like the wives and family included along with the hobbies. Also, we were glad to see the address for Ric Flair’s fan club. Needless to say, we’ve already joined. So, keep up the good work. I think a big mistake is being made by wrestling fans about Roddy Piper. People seem to overlook the class and genius this man poses. I admit he does take the short cuts, but with the wrestling skill he has, he doesn’t need to. At the age of 26, Roddy Piper is second only to Harley Race. Most wrestlers are just beginning to wrestle at the age of 26. I’ve been a wrestling fan for 12 years and have never seen a wrestler use the basic wrestling skills that I learned while wrestling in high school and college. Fans boo him and call him sissy because of his ancestral kilt, but they don’t realize that’s what he wants, that’s his motivation. Special Thanks to Peggy Lathan for her transcription of the Ringside newsletter.